Can a cantilever bridge be used to replace your missing tooth? There are many ways to replace a missing tooth. Most people would prefer to replace a missing tooth with something that feels like their own tooth, doesn’t have to come out of their mouth and something that doesn’t hurt their other teeth. If you are missing a tooth and you would like to know what options you have, our office would love to help! Our office will let you know if a cantilever bridge is right for you! Sometimes, genetics dictates that your are born with very small teeth or missing adult teeth. Our office, together with an orthodontic office are working to guide the patient’s teeth above into a more ideal position. This will allow future conservative restorations to replace the missing lateral incisor on one side of the mouth and improve the appearance of the ‘peg lateral’ on the left side. From the start of orthodontic treatment, we considered a cantilever bridge as an option on the right side. It is also important to keep the teeth from drifting forward into the open positions as they continue to develop which would make it more difficult to restore the teeth to more ideal esthetics. 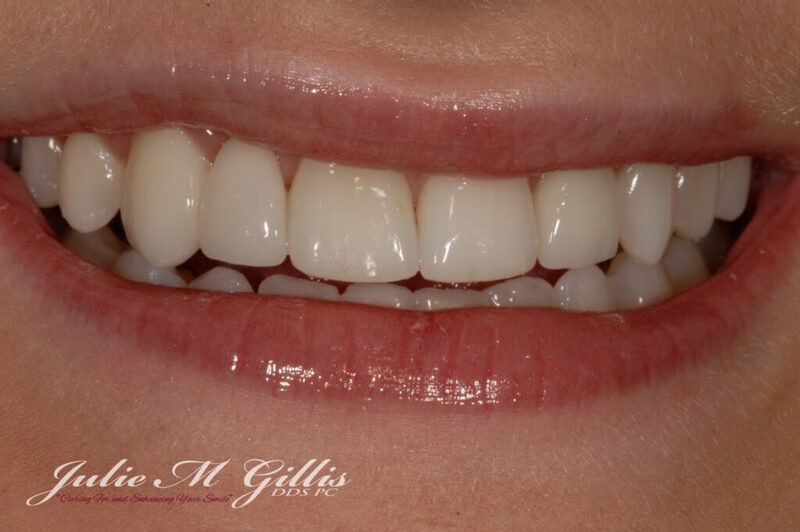 The use of a cantilever bridge to replace the missing right lateral incisor is a conservative option for a permanent, beautiful result. Your dentist and Orthodontist should have a plan as the teeth are erupting to allow for a future healthy occlusion (bite) and esthetics. Here we have given our patient the option of dental implants to restore the missing teeth or a cantilever bridge to restore the missing lateral incisor on her right. This photo shows the tooth preparations for a cantilever bridge on the right and a modified porcelain veneer on the left. The right canine tooth will support the cantilever bridge. What is a cantilever bridge? It is a little like a diving board. The bridge is supported usually by a strong tooth and a smaller tooth is suspended off of one side of the bridge. In the photo to the right you can see the conservative tooth preparations that were used. 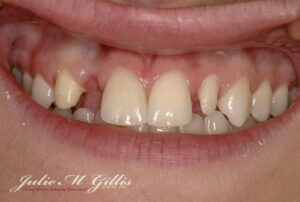 Our patient’s canine tooth was strong enough to support a suspended lateral incisor. We have shaped the gums slightly in the area of the missing right lateral incisor so that when the final bridge is in place, the tooth appears to ‘grow’ from the gums. 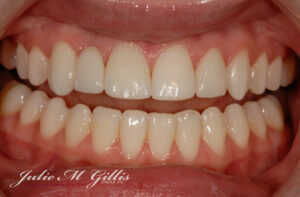 The small or ‘peg’ left lateral incisor is conservatively shaped for a porcelain veneer. The final result? Wonderful! Difficult to see which teeth are missing here! This is how it should be. Our Grand Junction office loves helping people achieve beautiful and healthy smiles. We see patients from all over Colorado. To find out more about us, please visit our web site at www.juliegillisdds.com. or call our office at (970) 242-3635.